Dave Downs will be at the Bridgewater Public Library on Tuesday, June 3rd to present: “Olde Time Schools”. His program begins at 7:00 p.m. This is an enjoyable presentation, mixed with humor and is full of little known interesting historical facts. Do you know why pencils are painted yellow? Did you know that no students recited the pledge of allegiance to the flag in the public schools until 1892? 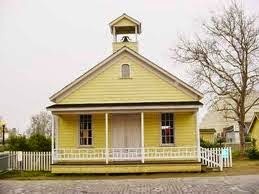 Dave will discuss 19th century schoolhouses, slate pencils, the horn book, punishments and many other interesting topics. Recipient of the “Best Exhibitor Award” at the New England History Festival, Dave is a retired school teacher with a Master’s Degree in Creative Arts in Education. He belongs to the Living History Association, the Olde Colony Civil War Round Table and the Rehoboth Minutemen. This free program will be held in the Flora T. Little Meeting Room, which is accessible by elevator. There is parking in back of the library, located at 15 South Street, Bridgewater.